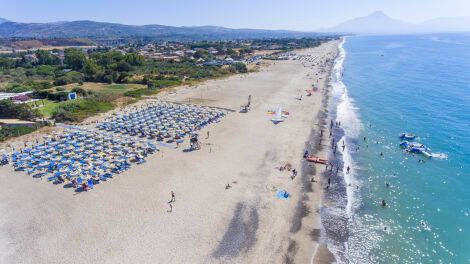 A 5-minute drive from the A20 Cefalù exit and the city Cathedral, Hotel Costa Verde boasts a free outdoor pool and a private beach. The hotel has a restaurant, a shared terrace and classically furnished air-conditioned rooms. Rooms at the Costa Verde hotel come with parquet floors, a flat-screen TV with satellite channels and a private bathroom complete with a hairdryer. Some rooms include views of the sea. You can start your day with a buffet-style sweet and savoury breakfast. There is a hairdresser's and a spa at the hotel, and you can book sessions directly on site. Free WiFi is provided in public areas, which also include a bar. You can engage in various activities, such as windsurfing and canoeing. The nearest airport is Falcone-Borsellino Airport, reachable in 1 hour and 10 minutes by car. Located in Cefalu, Hotel Tourist is by the sea, within a 10-minute drive of Church of Purgatory and Cefalu Cathedral. This beach hotel is 3.2 mi (5.2 km) from Museo Mandralisca. With a stay at Hotel Villa Belvedere, you'll be centrally located in Cefalu, within a 15-minute drive of Cefalu Beach and Salita Saraceno Staircase. This hotel is 4.7 mi (7.5 km) from Madonie Regional Natural Park and 0.8 mi (1.3 km) from Osteria Magno. 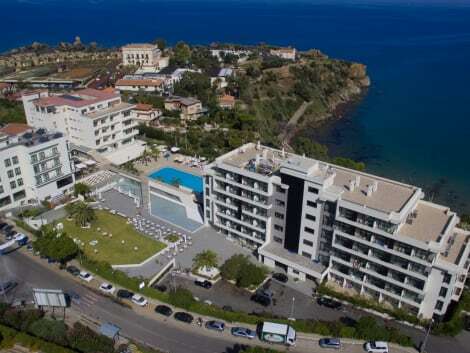 A modern 4-star hotel overlooking Sicily’s northern coast, the Hotel Santa Lucia Le Sabbie d’Oro sits just outside the historic and picturesque fishing town of Cefalu, with convenient transport links connecting you to the heart of town. Relax with a drink on the rooftop terrace, or enjoy traditional Sicilian cuisine in the restaurant. Hotel Santa Lucia Le Sabbie d’Oro’s classically-styled rooms are all en-suite and have satellite TV, safes and fridges. Make yourself at home in one of the 82 individually decorated guestrooms, featuring minibars and flat-screen televisions. Rooms have private furnished balconies. Complimentary wireless Internet access is available to keep you connected. Private bathrooms with showers feature bidets and hair dryers. Pamper yourself with a visit to the spa, which offers body treatments and facials. After a day at the private beach, you can enjoy other recreational amenities including a nightclub and an outdoor pool. This hotel also features complimentary wireless Internet access, concierge services, and babysitting/childcare (surcharge). Getting to the surf and sand is a breeze with the complimentary beach shuttle. Enjoy recreation amenities such as an outdoor tennis court or take in the view from a rooftop terrace. Additional amenities at this hotel include complimentary wireless Internet access, concierge services, and a television in a common area. Getting to nearby attractions is a breeze with the area shuttle (surcharge). La Dolce Vita is a high quality B&B located in the historic center of Cefalù, in an ideal location and place directly ubicated on the promenade at 2 minutes walk from the Cathedral. Close to the beach and the sea, it has a panoramic terrace overlooking the sea and free parking nearby. Surrounded by beautiful architecture of the city, the hotel is decorated with modern art, bright colors and bright lighteneing, and offers rooms located on the 2nd floor of a building without elevator that include free Wi-Fi connection. A complimentary breakfast is served each morning in a bar nearby and it is the typical Italian breakfast with croissants and cappuccino. The property is located along the coast dominated by Marchiafava's Bastion, in an area surrounded by numerous restaurants and shops. Among the services offered, the hotel also provides transfer service (extra charge and on request) to and from the airport and assistance in organizing excursions, boat trips, fishing tourism, sports such as windsurfing, parasailing, kyte surfing, golf and Diving. A stay at Baronetto B&B places you in the heart of Cefalu, within a 15-minute walk of Cefalu Beach and Osteria Magno. This bed & breakfast is 4.2 mi (6.7 km) from Madonie Regional Natural Park and 0.5 mi (0.8 km) from Church of Purgatory. Cefalú is one of the most popular destinations on Sicily. It sits along the northern coastline, more of a community than a town proper. After Taormina and Palermo, Cefalú is the third most popular among tourists who come here seeking a sun-soaked seaside holiday. Watching the sunset from the water's edge is a memorable experience here. The town's own attractive sights formed the backdrop for the 1988 movie Cinema Paradiso. The sandy, pristine beach attracts lots of sunbathers and holidaymakers when the weather is warm. The cathedral, Duomo de Cefalú, dates back to the 12th century. It was built following the Norman occupation of the town in 1091. Keep in mind that the cathedral is usually closed at lunchtimes. Another must-see is the Museo Mandralisca, a museum of art and archaeological relics collected by Baron Enrico Piraino of Mandralisca. From the town, it's roughly an hour's drive to Palermo. It has a busier atmosphere and lots of things to see and do. The long history and changing rule of Palermo can be seen in the ‘mix and match' architecture around the town. Sicilian cuisine uses plenty of spices, sugar and fruits, fish, seafood, nuts and vegeSEOSITE_LEVEL_DESCRIPTIONs. The region is also well known for its wine and olive oil. Antipasti – traditional starters such as cured meats, anchovies and mushrooms – are the first course in the vast majority of Sicilian restaurants. The influences from other countries can be seen in the Greek and French restaurants at Cefalú. You may also find the fusion of both – unusually, Le Chat Noir has calamari on the menu. Shops line the town's medieval, winding streets. The Corso Ruggero area has most of the stylish fashion outlets, and there are more on the Via Vittorio Emanuele. A bank, pharmacy and petrol station can also be found in this area of town. As an authentic souvenir of your time in Cefalú, pick up some locally made ceramics. A Lumera di Brocato is one of the largest ceramics shops, providing ornaments, vases, SEOSITE_LEVEL_DESCRIPTIONs, window boxes and more.